This work presents a design space in which personal devices are used as a means to faciliate “socially safe”, ad-hoc interaction with large public displays. Unlike most existing work that focuses on faciliating content placement and transfer, this approach aims at minimizing the effort required to initiate, sustain, and withdraw from interaction with a large public display, and to communicate these capabilities to passerby. We identify barriers hindering this process, and offer advice on overcoming them based on existing work and our own experiences with these displays. We illustrate how this design concept can be applied, and motivate applications in other domains. Cheung, V., Watson, D., Vermeulen, J., Hancock, M. and Scott, S.D. (2014). 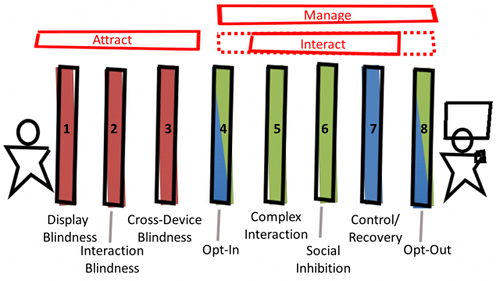 Overcoming Interaction Barriers in Large Public Displays Using Personal Devices. In Proceedings of ITS 2014: ACM Interactive Tabletops and Surfaces. Dresden, Germany, November 16-19, 2014.